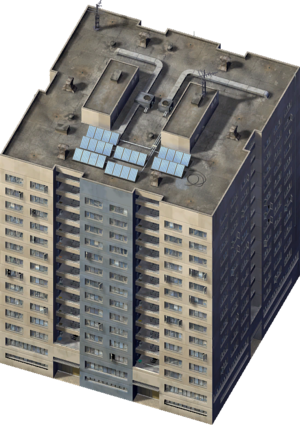 Tina's Tenements is a Low-Wealth Residential Building that grows on High Density Residential zones , added in the Rush Hour Expansion Pack. When the Colossus Addon Mod is installed, all of the default lots are have their stages set to Stage 10. Ajjanagadde Inc. • Todd & Co.
Hutt Enterprise Headquarters • Khoury Art Foundation Building • Todd & Co. This page was last modified on 28 June 2014, at 14:08. This page has been accessed 3,543 times.